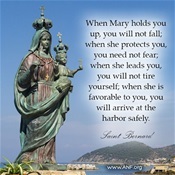 One of the amazing things about Mary is the Immaculate Conception. She was preserved from sin by the grace of God. She is perfectly pure. Today, let's pray for purity. Let's pray for the purity of our bodies, that we may treat them as temples of the Holy Spirit. Let's pray for the purity of our minds, that we may have holy thoughts. Let's pray for the purity of our hearts, that we may see God. Pray that God will grant us, and the world, greater purity in all respects. O most pure Virgin Mary conceived without sin, from the very first instant, you were entirely immaculate. O glorious Mary full of grace, you are the mother of my God – the Queen of Angels and of men. I humbly venerate you as the chosen mother of my Saviour, Jesus Christ. The Prince of Peace and the Lord of Lords chose you for the singular grace and honour of being His beloved mother. By the power of His Cross, He preserved you from all sin. Therefore, by His power and love, I have hope and bold confidence in your prayers for my holiness and salvation.